The race is on to see who is going to have the best outdoor Christmas lighting display in the neighborhood. So dust off the old boxes and get those Christmas lights ready for yet another year of fun and festivities. Before you can even begin putting those lights up, you have to engage in the tedious task of testing them out to make sure they still work. Let us help with the process. Find tips on planning and creating your most magnificent Christmas lighting display ever. But first lets look at some of the different types of christmas lights available today. In the past you may have used Christmas lights outdoors that were really made for indoor use. These are your typical string lights, like the ones you put on your Christmas tree. Many people use these as outdoor lights, failing to realize that some of them are rated for indoor use. Always check with the manufacturer to see how they recommend you to use these lights. 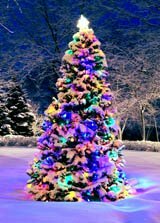 Outdoor Christmas lights are made specifically for outdoor use and use bulbs that often are much larger than ones made for indoor use. Because of their larger size, they often produce more light than those rated for indoor use. Typically outdoor string lighting uses bulbs that can be screwed in, therefore bulb replacement is easy. Finding replacement bulbs for burned out lights is often very easy. Icicle lights have gained in popularity and continue to be a favorite outdoor Christmas light. These lights are unique since they hang down off the sides of your house creating the impression that your lights have formed an icicle pattern. Icicle lights come in come in many different varieties. You can find outdoor rope lighting, outdoor string lighting, even outdoor LED lighting in icicle patterns and they even come in different colors. Icicle lights are easy to install and may require the use of special mounting hardware to make installation even easier. 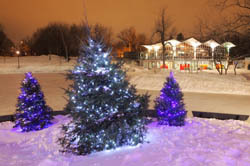 Today we have new and improved outdoor Christmas lighting technologies that use LED technology. Their lifespan eclipses that of traditional Christmas lights, they're much less fragile, and produce more vibrant colors than Christmas lights of the past. These LED Christmas lamps not only look better, but they last longer and stand up to shock better. If your thinking about decorating your home for the holidays, consider using outdoor LED lighting. Decorating your home's exterior is really a matter of personal preference. Taking time to plan your design is the difference between an average Christmas lighting display and an above average one. Model your Christmas lighting design from other lighting displays that you love. Look online, drive around your neighborhood, get inspired! Retain the look that you like and incorporate those ideas into your Christmas lighting display. Before installing even one Christmas light you must have an ultimate vision. Take some time out and literally take a few steps back from your home's exterior. Envision an outdoor lighting design that you would enjoy viewing as your walking by your house at night. Estimate how many strands of Christmas lights you will need and take notice of how many watts each stand uses. Take the sum of the collective watts from all the strands of lights you will use. If you have too many watts being routed to one circuit, you may need to run your Christmas lights on different circuits. You can also simply use fewer strands of lights. If thats not an option, you may want to look into installing another circuit with a larger capacity. Finding the right Christmas lights essential if you want your outdoor Christmas lighting display to be exceptional. I recommend you take a trip to a local Christmas shop to see what they have to offer. Take a look online, compare prices, and pickup some christmas outdoor lighting ideas from the holiday displays almost every store puts out way before Christmas time. Using the right clips and hangers for your needs is key. You must know what type of Christmas lights you're going to be using as well as where you plan on installing them. Clips and hangers come in many styles. Don't skimp on these, they are very inexpensive and tend to make your life much easier. If you will be working on the roof or up a ladder make sure to anchor yourself to something sturdy. Buy a quality harness that attaches to a fixed part of your home's exterior. Spending Christmas in a body cast isn't exactly my definition of fun, so take precautions seriously. Every Christmas light ever made does not have to be on your front yard. Planning your Christmas lighting design is the only way to avoid excessive use of outdoor Christmas lights. Planning and moderation is key. Stick with one style of Christmas lighting if possible. Every manufacturer makes their lights a bit differently with varying degrees of brightness and color. Colors may vary only slightly but that slight difference can be easily seen when connected with lights from other manufacturers. You also want to try and keep the same style Christmas lights together. You want to make your design flow as easily and freely as possible. Avoid connecting different types of outdoor lights that just don't match up. It is always best to use the most energy efficient outdoor Christmas lights possible. They will not only save you a ton on electric bills but will allow you to link more Christmas lights onto one circuit without blowing a fuse. The holidays would just not be the same without outdoor Christmas lighting. Sharing with others the joy you have for the holidays makes it an extra special experience for all to enjoy.